Sitting in the opening session of the Business track at EGEE, I was interested to hear Santi Ristol from Atos Origin and BeInGrid talk that he mentioned that the Cloud might 'take over' a lot of the work of the Grid. 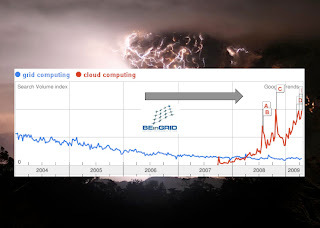 As proof he showed the image on the left, tracking the popularity of the terms grid computing and cloud computing. Clearly the Cloud is the 'new kid on the block' and is getting a lot of attention but I am not sure I agree on the ability of the Cloud to replace the Grid in many cases, though it might be stealing some of its thunder! Rather, I take a view similar to that of Gartner, the global research firm. The latest edition of their Hype Cycle report rightly places the Cloud at the 'peak of inflated expectations', and it soon will have its 'Trough of disillusionment' I suspect. Meanwhile I think the Grid is past this phase and somewhere on the 'Slope of Enlightenment', close to where Gartner place Service Orientated Architectures. With the impending data-taking from the Large Hadron Collider at CERN, at least the ARC and gLite middlewares are going to be in daily production use for global scientific collaborations. This is not business use of course, but this is an area where the Grid will be used in anger, and one cannot drop a cloud solution in instead. This is not to say Clouds are not very powerful tools, but exactly what they are is still in flux. This was also noticeable at the Grids and Clouds session earlier in the week, where most of the talks were more about virtualisation than the Cloud as seen in the outside world. The exceptions was BalticCloud who are Grid people experimenting with systems like Hadoop and Eucalyptus - very much core Cloud technologies. In many ways I saw the same in the Grid world back in 2004 - when it was hard to get people to agree to a definition of a Grid. These discussions were not exactly definitively settled but in the following five years, real Grid implementation superseded academic definitions, and now a Grid is the thing you see deployed all over Europe in both the academic and business communities. My guess is that Clouds will go in a similar direction, though I find it very interesting that the Cloud, at least in the general consciousness, seems to grow out of a commercial product sold by Amazon rather than from an academic idea. This may well mean that the Cloud follows a different development path, but it will take some time to be able to understand what is hype and what is real use. My guess is that the Grid and the Cloud will end up complementing rather than competing with one another. I have a hunch that they may become different parts of a spectrum of distributed computing technologies that serve a variety of academic and commercial demands. Until then, like many of my fellow delegates at EGEE'09, I will be keeping an eye on both. Let me add to your post that we had a very interesting session on Grids and Clouds, and all the speakers and not only BalticCloud presented their experiences in using IaaS clouds to enhance Grid computing. See for example the presentations by CERN and NIKEF about their work using OpenNebula (one of the RESERVOIR technologies) to optimize and simplify use and operation of Grid sites. While NIKEF is more interested in the OCCI-API (new OGF open cloud computing standardization effort), CERN is evaluating the EC2 interfaces, both provided by the OpenNebula open-source toolkit for cloud computing. INFN also presented an interesting approach to bring cloud to grid sites. After this session I co-chaired with Steven Newhouse a session about the collaboration between RESERVOIR, flagship of European Projects in cloud computing, and EGEE. The MoU between both projects and the state of the activities were presented, clearly demonstrating, as you state in your post, how they complement each other. CERN showed how OpenNebula cloud software allows EGEE sites to easily meet the users demands (i.e. worker node configurations) or to scale up services to meet peak loads. In other words, to "shape" a EGEE site to meet the highly dynamic demands of the researchers. They are also experimenting with the OpenNebula implementation of the EC2 Query.